Tópico em 'Climatologia' iniciado por 1979 23 Nov 2016 às 21:20. Iberian plus southwestern French climate map according Trewartha system, being slightly modified by Roberto Subverviola's rules. * Roberto Suberviola is an agricultural engineer from Pamplona, northern Spain, who is member from the Spanish weather forum Meteored.com. The letter "C" means Warm temperate climates with eight or more months with 10º C as monthly average temperature. "Cf" means the rainless month during summer is 30 mm or even higher. However, in northern Portugal, even if the rainless month is lower than 30 mm, it is "Cf" when the annual yearly rainfall is higher than 1200 mm. "Cs" means the rainless month during summer is lower than 30 mm. The letter "D" means there are less than eight months with monthly average higher than 10º C.
"Do" means both the average temperature for the coldest month is higher than 0º C and average rainfall for all the months is higher than 30 mm. However, in northern Portugal, even if the rainless month is lower than 30 mm, it is "Do" when the annual yearly rainfall is higher than 1200 mm. "Ds" means the average rainfall for the rainless month is lower than 30 mm. 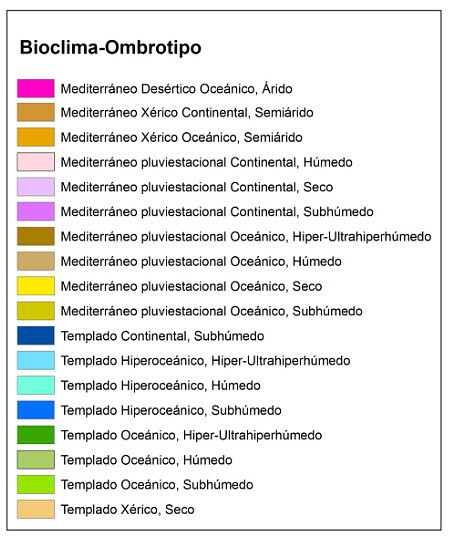 Although Trewartha system doesn't have this one, it is realy useful to classify the iberian climates that are located inland. "Dc" means cold climates from highest mountains where January average temperature is lower than 0º C.
"BS" means semiarid climates that yearly average rainfall ranges from 150 to 325 mm, as 325 mm is the best way to put apart semiarid climates from all the others rainier climates within the Iberian peninsula because it fit very well our semiarid landscapes. "BW" means arid yearly average rainfall being lower than 150 mm. The third letter "a" means monthly average temperature for the warmest month is higher than 22º C.
The third letter "b" means monthly average temperature for the warmest month is lower than 22º C.
The third letter "h" means yearly average temperature is higher than 18º C, but this one is only for arid and semiarid climates. The third letter "k" means average yearly temperature lower than 18º C, but this one is only for semiarid climates. It's a climate that doesn't cover much territory within the Iberian peninsula. It appears in Girona prelitoral and has somewhat continental influece that makes it prone to significant daily and interannual temperature fluctuations. It can be also found in most coastal areas and medium-sized mountain areas of the Azores Islands. So, in this case it would be a humid subtropical climate with exceptional frost and a long, warm to hot summers. In both cases the annual pattern of both temperatures and precipitation match all the typical features of Mediterranean climate, except that the rainless summer month always measure more than 30 mm. Examples: Girona (14.7º C, 728 mm), Horta (17,3º C, 985 mm). Other examples elsewhere in Europe: San Benedetto del Tronto (Italian eastern coast, 15.0º C, 757 mm). Other examples that are located outside Europe: Istanbul (Turkey; 14,3º C, 843 mm). This climate can be found along coastal areas of the northern coast from southern Pontevedra to northern Aquitaine coast in southwestern France. The coastal strip where this climate appears is smaller than 20 kilometres width, except for the southwestern French coast because there are not mountains running parallel the coastline. The rainfall pattern has a minimum peak during summer, although the farther west you go in Spain, the more rainless the summer gets. However, eastern Basque Country coast, although still has a minimum peak during summer, is quite rainy too, getting rainless again once you move north across southwestern French coast. Within Cfb climates, the driest summer month, which is usually July, is always higher than 30 mm. Both winter and summer tend to have small temperature fluctuations, so the average annual temperature variation is about 12º C. Both frost and heat waves are rare, although southerly winds sometimes bring 40º C, or even more. Examples: A Coruña (14,8º C, 1014 mm), Santander (14.5º C, 1129 mm). 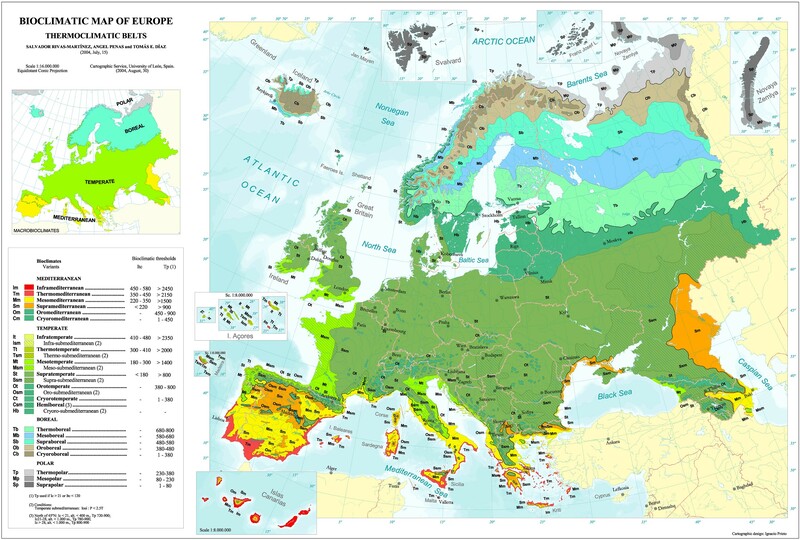 Other examples elsewhere in Europe: This climate can't be found in others parts of Europe, except Bordeaux and La Rochelle area in western France as the northernmost boundary of this climate. Other examples that are located outside Europe: Gisborne (North Island of New Zealand; 14.5º C, 1050 mm). Now we are talking about one of the most prominent climates of the Iberian peninsula, as it covers the southern half of Portugal (except the western coastal strip), some inland areas of the southern plateau, including most of Extremadura and the western part of Castilla-La Mancha, the whole Guadalquivir valley, some areas of the Ebro valley below 400 metres above sea level and most of Mediterranean coast as well, except for the semiarid strip of the southeastern coast. Winters use to be mild, except the Ebro Valley and the higher areas of the southern plateau where frost tend to be common. Summer is always warm, sometimes hot, and the driest summer month means less than 30 mm. About the rainfall pattern, there is a clear summer minimum peak, but the maximum rainfall peaks occurs is not the same throughout the whole area. So, the Atlantic subtype from southern Portugal to Málaga has a maximum rainfall peak in early winter; the Mediterranean coast from Granada to the French coast and most of southern plateau has a maximum in mid to late autumn, and the Ebro valley experiences its rainiest peak in spring. This climate can also be founf in Balearic islands and some areas of northern islands of Tenerife, Gran Canaria and La Palma in the Canary Islands, although, unlike in the peninsula, here the subtropical dry influence is strong, and also the cold waves are unheard of. Examples: Madrid (14.5º C, 371 mm), Barcelona (16,1º C, 588 mm), Seville (19.2º C, 539 mm). Other examples elsewhere in Europe: Athens (Greece southern coast; 19,1º C, 419 mm). Other examples that are located outside Europe: Adelaide (southern Australian coast; 17,1º C, 543 mm). It's the Mediterranean climate that is strongly influenced by the cool waters of the Atlantic ocean. It has small fluctuation with mild winters and warm summers. Both frost and heat waves are weak. We can find this climate from southern Pontevedra coast in northwestern Spain all the way down south to Cape Vicent. The rainfall pattern is typical Mediterranean one with a summer minimum peak and a winter maximum peak, being both very pronounced. This whole area is one of the peninsular areas with lower amount of thunderstorms within the Iberian peninsula, and they are even less likely during summer months. The islands of Madeira also fit this type of climate. Examples: Coimbra (15.5º C, 905 mm), Viseu (13,6º C, 1170 mm). Other examples elsewhere in Europe: This climate can't be found in other parts of Europe. Other examples that are located outside Europe: Santa Rosa (northern prelitoral of California, USA; 15,1º C, 817 mm). It is the climate of the higher areas of the southern plateau, also some areas of the Ebro Valley that are located above 400 metres above sea level, the mountains areas of Catalan Pre-Coastal Range, and with much lesser extent, some mountainous areas of southwest peninsular quadrant. Winter uses to be cold and summers are long and hot. The fluctuation is strong in some places within this climate, even reaching 19 or 20 degrees Celsius. Frosts are common in winter and heat waves are also usually likely every summer. The rainfall pattern is different in each area within this climate; so, in La Mancha southern plateau usually there is a early winter maximum, while most areas in the Ebro Valley have tow almost equal rainiest peaks both in autumn and spring, even some areas through the Ebro valley can receive less precipitation during winter months, and a few more during summer months, but still such two rainy equinoctial peaks still happen. Examples: Albacete (14,3º C, 353 mm), Cuenca (13,1º C, 501 mm). Other examples elsewhere in Europe: Manosque (mountainous prelitoral of southeastern France, 12.8º C, 423 mm). Other examples that are located outside Europe: Medford (inland valleys of southern Oregon in the western United States; 13,1º C, 465 mm). This climate appears in the northern plateau and most of the Sistema Ibérico mountain range. Excluding the highest mountains, this climate experiences the coldest winters within the Iberian peninsula so far. Thus, the Sistema Ibérico mountain range is often prone to heavy fluctuations, both daily and monthly, whereas the northern plateau is sligthly less prone to it. Most climate charts of many from cities of the northern plateau are very similar to northern French and France western Germans ones, except there is a rainless peak in the summer months. Everyone should agree how these areas do not have a pure Mediterranean climate but fall in the spectrum of temperate climates type D. In fact, the easternmost parts within this climate have such a great number of summer thunderstorms. Examples: Molina de Aragón (10.5º C, 468 mm), Burgos (10,7º C, 546 mm), Leon (11,1º C, 507 mm). Other examples elsewhere in Europe: Korce (mountainous inland of southern Albania; 11,0º C, 719 mm). Other examples that are located outside Europe: Merzifon (mountainous interior of northern Turkey; 11.5 ° C, 418 mm). It's one of the less common climates of the Iberian peninsula, although is still pretty common in many areas of inland southwestern France. This climate mainly appears falnking the eastern Pyrenees foothills. Winters tend to be cold whereas summers tend to be warm to hot cold winters and hot summers, therefore the whole area experiences signficant variation in temperature, both daily and monthly. ALthough is one of the most thundery places of the Iberian peninsula every summer, still summers are hot enough to give the landscape just a mediterranean feeling. This climate fit very well the boundary between mediterranean and oceanic climates either in southeastern Pyrenees and most of inland southwestern France .About the rainfall pattern throughout the year, it has two almost equal maximum peaks, (both in autumn and spring), with a slight summer minimum, but still a few places within this climate experience winter minimum as well, which is pretty uncommon both in the Iberian peninsula and southwestern France. Examples: Graus (12º C, 671 mm), Tremp (13,3º C, 645 mm). Other examples elsewhere in Europe: Turin (Alpine foothills in the northern third of Italy; 12,0º C, 981 mm). Other examples that are located outside Europe: Krasnodar (prelitoral plains near the Black Sea in Russian Caucasus, 12.1º C, 735 mm). Now we are talking about the typical oceanic climate that can be found in most of Europe with frequent frosts every winter, with mild summer and enough rainfall throughout the year, although there is still a clear minimum rainy peak in summer both in the Iberian peninsula and southwestern France. As an explanatory note,if you go anywhere north of Loira valley, the summer minimum peak is replaced by either late winter or early spring minimum peak. This climate can be found along the Cantabrian coast except for the coastal area which belong to temperate climates warm, (Cfb). Examples: Vitoria (11,7º C, 742 mm), Lugo (12º C, 1052 mm), Pamplona (12,9º C, 674 mm). Other examples elsewhere in Europe: Lille (plains of northernmost France, reaches 10,8º C, 742 mm). Other examples that are located outside Europe: Aberdeen (prelitoral of Washington state in northwest USA, 10.2º C, 2113 mm). It is located in the southeast Spanishcoast from western Almeria coast to the city of Alicante, also in the southern midlands of the islands of Tenerife, Gran Canaria, La Gomera and La Palma. So, the southeast coastal trip is still a coastal Mediterranean climate with strong semiarid influence by the rain shadow given by the Sistema Bético mountain range, while in the Canary islands case we are talking about pure dry subtropical influence. Despite its strong semiarid influence, the southeastern coastal strip occasionally experiences heavy, torrential and brief downpours in early to mid autumn, as it happen along the Valencian and Catalan coast and Balearic islands as well. Examples: Murcia (18.6º C, 297 mm), Alicante (18.2º C, 277 mm), Santa Cruz de Tenerife (21.5º C, 226 mm). Other examples that are located outside Europe: Sfax (central coast of Tunisia; 18,6º C, 236 mm). Now we are talking about a Mediterranean climate with strong semiarid influence that are located either at low altitude above sea level along the Ebro valley (by rain shadow given by either Pyreneees, Sistema Ibérico and catalan Pre-Coastal mountain ranges), and some mid-mountain or plateau areas located inland southeast. Most of these areas have two almost equal maximum rainy peaks in autumn and spring, although the spring rainfall is slightly higher. Irregular rainfall pattern either montly or from year to year is likely as well. Inland Murcia and eastern Albacete areas can experience snow sometimes. About the Ebro valley, it is really prone tohigh radiation fog within several days from November to Frebruary, and some convective activity that gives them thnderstorms within the warmest half of the year, especially during late spring. Examples: Zaragoza (15.5º C, 322 mm), Jumilla (15.4º C, 294.0 mm). Other examples that are located outside Europe: Tabriz (northern Iran; 12,6º C, 283 mm). It's the arid climate that can be found in some areas of Canary islands because of both the Sahara desert plus the subtropical high makes this area just arid. Examples: Fuerteventura airport (21,1º C, 98 mm), Lanzarote airport (21,1º C, 111 mm). Other examples that are located outside Europe: Mexicali (Baja California, México; 23,0º C, 74,5 mm). It's the coldest climate that can be found across the Iberian peninsula, where snow is often frequent every winter and summers are not pretty warm, but mild. Climas Cs: la precipitación del mes más seco del verano es inferior a 30. 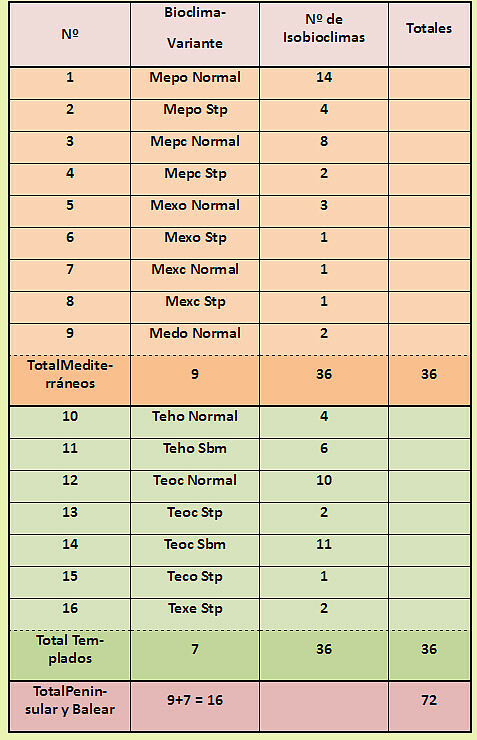 Climas templados (D): menos de ocho meses con más de 10 grados de temperatura media. Climas Ds esta categoría es propia y Trewartha no la utiliza pero sirve para delimitar los climas ibéricos de interior): la precipitación del mes más seco es inferior a 30 o 20 mm. Climas Dc: La temperatura media del mes más frío es inferior a 0º C.
Climas BW: la precipitación media es inferior a 150 mm. a: temperatura media del mes más cálido superior a 22ºC. b: temperatura media del mes más cálido inferior a 22ºC. También es el propio de las zonas litorales y medianías de las Islas Azores, en este caso sería un clima subtropical húmedo con heladas excepcionales y con un verano largo y cálido En ambos casos la evolución anual de las temperaturas y las precipitaciones es similar a la de los climas mediterráneos típicos con la salvedad de que durante los meses de verano se superan los 30 mm. Se trata del clima propio de las zonas litorales de la Cornisa Cantábrica, Galicia y costa portuguesa aproximadamente al norte del estuario del río Duero. Se daría en una estrecha banda costera de menos de 20 km de anchura que llegaría por el norte hasta las Landas aquitanas. La distribución de la precipitación presenta un mínimo muy marcado durante el estío; se ha tomado como límite meridional en la costa portuguesa la isoyeta de 20 mm para el mes de julio. En cuanto a temperaturas tanto el invierno como los veranos son suaves (la oscilación térmica anual es la menor de toda la Península, rondando los 12ºC),: heladas muy escasas y débiles y olas de calor prácticamente inexistentes aunque con vientos del sur se han llegado a alcanzar los 40ºC en diversas localidades de la costa cantábrica. Hablamos aquí de un clima que alcanza una gran extensión en nuestra Península, abarcando la mitad meridional de Portugal (excepto la banda costera), zonas del interior de la Meseta sur, incluyendo toda Extremadura y la parte occidental de Castilla-La Mancha, el valle del Guadalquivir y todo el litoral mediterráneo desde el Estrecho de Gibraltar hasta el Ampurdán introduciéndose en el interior en el Valle del Ebro hasta una altitud de unos 400 metros. Se excluye la zona árida del sureste que se incluye dentro de los climas áridos (B). Se caracteriza por inviernos suaves, salvo en el Valle del Ebro donde son habituales las heladas invernales, y veranos calurosos y secos (el mes más seco con una precipitación inferior a 30 mm). Este tipo de clima puede dividirse según el régimen pluviomético, ya que aún presentando en todos los casos un claro mínimo estival, el máximo pluviométrico se presenta en distintas estaciones según las zonas en cuestión. El subtipo atlántico tiene un claro máximo invernal; la costa mediterránea desde el límite entre las provincias de Granada y Almería presenta un máximo otoñal y en la zona del Valle del Ebro con este clima el máximo suele ser primaveral. Este clima también se da en el archipiélago balear y en el norte de las islas de Tenerife, Gran Canaria y La Palma dentro del archipiélago canario. Es el clima mediterráneo que por encontrarse fuertemente influenciado por las frescas aguas del Atlántico presenta una oscilación de temperaturas pequeña con inviernos muy suaves y veranos templados. Tanto las heladas como las olas de calor son escasas. Su distribución principal es portuguesa en una franja litoral que va desde el estuario del Duero hasta el cabo San Vicente. El régimen pluviométrico es el típico mediterráneo con mínimo estival y máximo invernal muy pronunciados. El clima de la isla portuguesa de Madeira también se incluiría en esta variedad. En estos climas aparece ya un verdadero invierno. Se han incluido en este tipo de climas lugares que habitualmente en la bibliografía se suelen denominar como “climas mediterráneo-continentales”; siguiendo la clasificación propuesta en este documento estos climas de interior con características mediterráneas pero con inviernos relativamente fríos se han incluido dentro de los climas templados (tipo D). Es el clima propio de la Mancha, zonas del Valle del Ebro por encima de los 400 m de altitud, y del interior de Cataluña. Los inviernos pueden ser fríos y los veranos son largos y calurosos. La oscilación térmica es elevada alcanzándose en algunos lugares los 19 o incluso los 20 grados. Las heladas son habituales en invierno y las olas de calor también se suelen presentar en prácticamente todos los veranos. El régimen de precipitaciones es variado; en la Mancha suele tener un máximo claro invernal, mientras que en las zonas situadas en el Valle del Ebro los máximos suelen ser equinocciales y en algunas comarcas incluso el invierno puede recibir menos precipitación que el verano. Es el clima de interior que se observa en la Meseta norte y la mayor parte del Sistema Ibérico. Estas grandes zonas son las que sufren los inviernos más rigurosos de la Península si exceptuamos las zonas de alta montaña. El Sistema Ibérico presenta una gran continentalidad, siendo ésta mucho más moderada en la Meseta septentrional. El diagrama climático de muchas de las localidades de la Meseta Norte es muy similar al que presentan ciudades de Francia o incluso del oeste de Alemania salvo por el hecho de que la precipitación presenta un mínimo, a veces no demasiado marcado, en los meses estivales; es en estos casos cuando es más evidente que estas zonas no poseen un clima mediterráneo en sentido estricto sino que su clima entra ya dentro de lo que se puede denominar como climas templados tipo D.
Se trata de un clima con escasa representación en nuestro territorio. Sus enclaves se presentan en el Prepirineo, desde la Ribagorza oscense hasta el interior norte catalán. En estas comarcas los inviernos suelen ser fríos y los veranos calurosos de ahí que su oscilación térmica sea de las mayores de la Península Ibérica. Las tormentas estivales frecuentes hacen que el clima sea considerado como Do y no Ds aunque el paisaje natural tenga un aspecto en muchos casos marcadamente mediterráneo. El régimen de precipitaciones suele presentar máximos equinocciales y en algunos lugares un mínimo absoluto invernal, que no suele ser nada frecuente en nuestra geografía. Hablamos del clima oceánico típicamente europeo con un invierno con heladas frecuentes, un verano suave y precipitaciones abundantes durante todo el año aunque en general con un claro mínimo estival. Es el clima propio de la Cornisa Cantábrica salvo la zona litoral que pertenecería a los climas templado cálidos (Cfb); también se ha incluido la zona pirenaica en este tipo climático. La temperatura del mes más frío es inferior a 0º C, las nevadas son frecuentes y los veranos son relativamente frescos. Estos climas caracterizados por la escasez de precipitaciones en la Península se observan en el extremo sureste peninsular, desde la provincia de Almería hasta el sur de la provincia de Alicante, ocupando una franja litoral más o menos extensa. También son propios de la mayor parte de las Islas Canarias, especialmente de las islas de Lanzarote y Fuerteventura. Ejemplos: Murcia (18,6ºC, 297mm), Alicante (18,2ºC, 277mm), Santa Cruz de Tenerife (21,5ºC, 226mm). Se localiza en el interior del sureste español y a lo largo del tramo medio del valle del río Ebro en el noreste peninsular. Ejemplos: Zaragoza (15.5º C, 322 mm), Jumilla (15.4º C, 294.0 mm). Ocupa la totalidad de las islas de Fuerteventura y Lanzarote así como los extremos meridionales de Gran Canaria y Tenerife. Ejemplos: Fuerteventura Aerop. (21,1ºC, 98mm), Lanzarote Aerop. (21,1ºC, 111mm). How Madeira and Azores, for example have such continuous areas with the same climate? Simply impossible. Douro basin also has greater divisions, it´s not that homogenous. Data seems to be based on just certain weather stations that were chosen by someone..
Como bien dice el compañero @belem, ese mapa resulta claramente mejorable. Más allá de lo ya comentado, resulta llamativo lo defectuoso del trazado al respecto de las zonas montañosas (no escasas precisamente en la Península), tanto en la selección de las superficies y polígonos (que minimizan claramente su extensión) como en el nivel de detalle. Notablemente mejorable también la versión inglesa de algunos partes de la leyenda, diciendo cosas que no terminan de coincidir con la realidad (incluso con la versión española) o la minimizan. Sirve de aproximación genérica. Poco más. - Los Isobioclimas Mediterráneos (identificadores 1-36) ocupan las Submesetas Norte y Sur, las Depresiones del Ebro y del Guadalquivir, así como los sistemas montañosos de los Montes de Toledo, Sierra de Cazorla, y Sistemas Bético y Penibético. - Los Isobioclimas Templados (identificadores 37-72) ocupan el borde norte y montañoso peninsular: Galicia, Asturias, Cantabria, País Vasco, Pirineo y Pre-Pirineo, así como gran parte de los Sistemas Ibérico y Central. - Las tormentas de verano, al atenuar la sequía estival, son las responsables de que los Sistemas Ibérico y Central gocen de Isobioclimas Templados, si bien en sus Variantes Submediterráneas: esas montañas son islotes templados que emergen en un fondo mediterráneo. - Sorprende que los Isobioclimas Templados, que sólo ocupan el 20-25% de la España Peninsular y Balear, sean tan numerosos e igualen, en número, a los Mediterráneos. - La Depresión del Ebro presenta una complejidad y una singularidad climáticas muy grandes: complejidad, ya que en ella se reúnen 8 Bioclimas-Variantes -la mitad de las existentes en todo el territorio estudiado-; y singularidad, porque es el único territorio Mediterráneo Estépico, con 4 Bioclimas-Variantes Estépicas exclusivas, y con 7 Isobioclimas Estépicos, también exclusivos. - La riqueza bioclimática de la España Peninsular y Balear se pone de manifiesto cuando se comparan las unidades bioclimáticas del mundo y las que se dan en el territorio estudiado por nosotros: tenemos 2 Macrobioclimas, de los 5 existentes en el mundo; 5 Bioclimas Mediterráneos, de los 8 que hay en el mundo, y 4 Bioclimas Templados, de los 4 que hay en el mundo; 6 de los 7, y 5 de los 7 Termotipos Mediterráneos y Templados, respectivamente existentes en el mundo; 7 de los 9 Ombrotipos del mundo; y 72 de los 351 Isobioclimas mundiales. - Comparando Diversidad Bioclimática y superficie territorial, la España Peninsular y Balear tiene 1/5 de los Isobioclimas del mundo, en tan sólo 1/300 de las tierras emergidas: es decir, la España Peninsular y Balear tiene una Diversidad Bioclimática 60 veces mayor de la que le correspondería simplemente por extensión territorial. Penso que nos dá uma melhor ideia da diversidade climática em Espanha. Sobre Portugal, desconheço a existência de trabalhos com esse nível de detalhe. Pode-se é juntar alguns avanços nesse sentido (tendo em vista uma representação mais fiel da realidade climática/bioclimática). Lembro-me de uma tese de mestrado que encontrei na internet e por acaso gravei a imagem já há uns anos (posso procurar pela referência para quem estiver interessado). Existem contudo algumas limitações, devido a algumas faltas de dados. A zona do Gerês, por exemplo, poderá ser ainda mais húmida do aqui é indicado, e as zonas Semi-áridas e Áridas da Beira Baixa, devem ter uma distribuição algo mais localizada. Enquanto que na zona do Côa, se calhar atingem-se ombrótipos já de tipo semiárido. Sobre os Açores (e a Madeira) desconheço a existência de trabalhos com este nível de rigor. Nos Açores, sei que existem verdadeiros climas subtropicais húmidos (desconhecidos no resto da P. Ibérica, tanto quanto sei), e onde se situam ainda existe uma verdadeira flora subtropical (laurissilva), sendo neste capítulo, um local com características únicas na Europa. Mas isto é apenas um avanço, ainda muito está por melhorar. Thomar e guisilva5000 gostaram disto.